Squid ink and sesame crisp with smoked eel - I'm not sure why they changed things around, but the proportions tonight were all wrong. There's simply too much smoked eel here versus the crisp, and too salty as a result. Endive with salmon roe - love how they pop in my mouth. Cold corn soup with popcorn and nachos - interesting... creamy corn soup, with corn kernels, and a layer of ground nachos and (perhaps) popcorn on top. You know what this reminds me of? 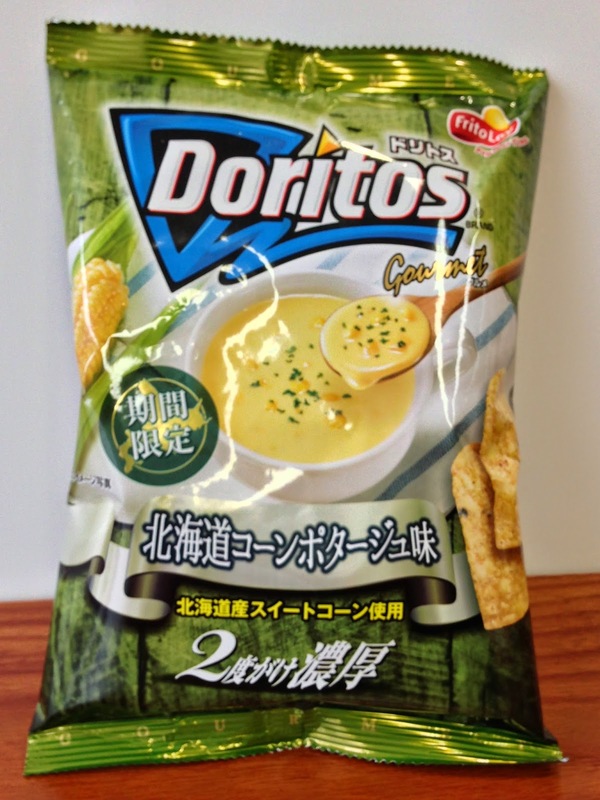 Those corn potage-flavored Doritos made in Japan that I bought last year. Whelk with mayonnaise - the whelk was reasonably nice, and the mayo added a dimension of richness here, while strips of onion added a little sweetness and slight crunch. Interesting use of deep-fried parsley (?) on top. Oyster with oyster mayonnaise and risotto - this came with slices of raw Prat-ar-Coum oysters from Brittany. Very tasty. However, when I took my first bite of the "risotto", I realized that these weren't arborio, carnaroli or any type of rice. This was orzo. I do love orzo for the wonderful texture... Another pretty rich dish. Pan-fried lobster with beef jus and lardo - interesting combination, with both beef and pork elements pairing with the lobster. Unfortunately the lobster was a tad overcooked. Crispy fried whiting with yogurt and seaweed sauce - the whiting itself was pretty yummy, and if it were any fluffier I would have mistaken it for Bombay duck (九肚魚). Served with both the leaves as well as the stalks of Swiss chard. Lemon sorbet with gin and egg white - this was explained as similar to a "gin fizz". Definitely tasted the alcohol. French pigeon with chick peas - the Maulevrier pigeon was no doubt slow-cooked and very tender. I love gamey birds, but for some reason this pigeon tasted like chunks of pig's liver... and all of us agreed on this point. Served with charcoal sauce. The crispy squares of filo on the side were tasty. Goat cheese with white button mushrooms - the goat cheese had fairly high acidity, so it definitely needed the cashew cream and especially the honey to balance things out. The paper-thin wafers of white button mushrooms on top seemed interesting. 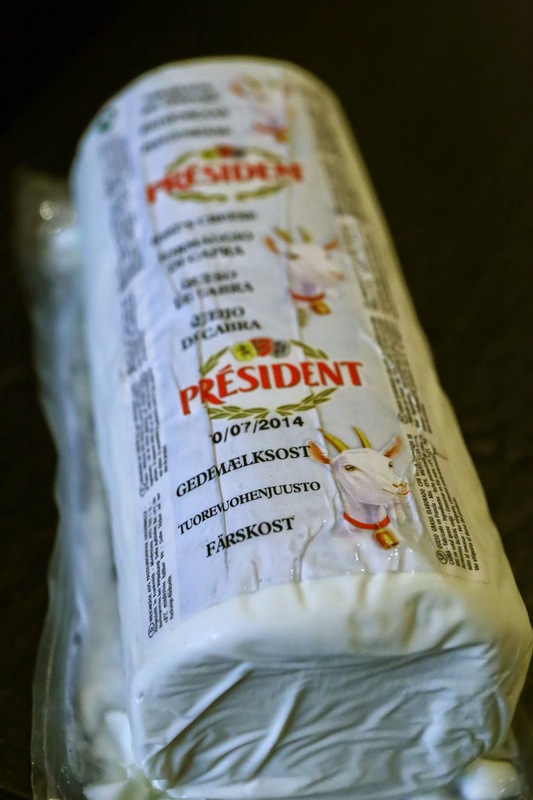 I wanted to find out what kind of goat cheese it was, and was told that this was simply "goat cheese". When I refused to accept this generic answer, the staff brought out the cheese in its original packaging. This was when the letters "W-T-F" popped up in my head... No wonder the staff didn't know... because the package did just say "goat cheese" in probably 6 or 7 languages! OK, call me a cheese snob, but I've been spoiled by Jeremy and many others who bring in artisanal cheese into Hong Kong. When your sister flagship restaurant has 2 macarons in Paris, the last thing I expected you to serve me was something out of a plastic pouch from Président. Dude, that's just one step up from serving me La vache qui rit... Not very grand at all. Poached pear with hazelnut ice cream and caramel - not bad when you mix the three together. Chocolate cream with orange zest, chocolate crisp and crumble - pretty yummy. Pineapple with charcoal ice cream - ah, the classic Akrame dessert. Still good. Finally we end up the mignardises, which were little bites of meringue with lemon and coriander, along with the dark chocolate with sea salt. I was, of course, having dinner with the Alcoholics, and we each brought a bottle of wine representing a different region in France. Thankfully one of us was able to bring a bottle of Rhône, which turned out to be the wine of the evening. Here is where I confess to doing something I don't normally do. We were initially asked to put up a deposit for a larger party, and I decided to give out my blog email address for them to send me the instructions. I knew that my email address is in the restaurant's database, and figured that they would realize the reservation was being made by the terrorist blogger. Well, I think they did know who I was, which was probably why they very kindly waived the corkage for us tonight. 1995 Krug - very toasty, with coffee notes. Ripe on the palate with an acidic finish. 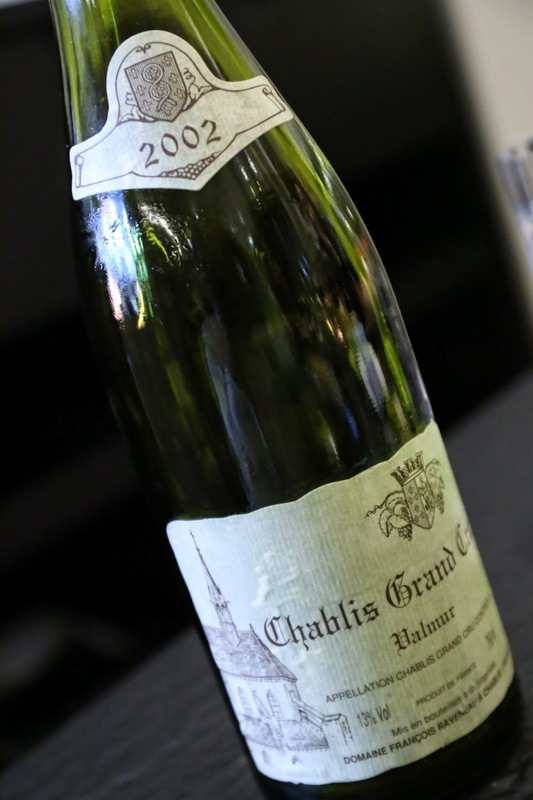 2002 Raveneau Valmur - initially too cold so the nose didn't show, with a hint of lemon citrus and flint. Later on as it warmed up, it only showed a little better, with a little more ripeness. 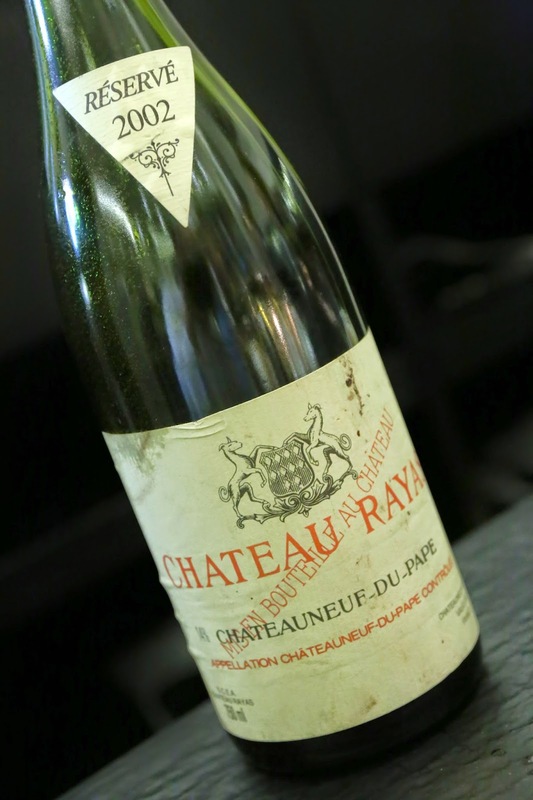 2002 Rayas - popped open the cork and the wine was ready immediately. Sooooo amazingly floral, with unmistakable rose, and sweet fruit like lychees. This was like Pierre Hermé's Ispahan - with rose, lychees and raspberries - just in a glass of wine! Later on it also showed a little bit of pine needle. 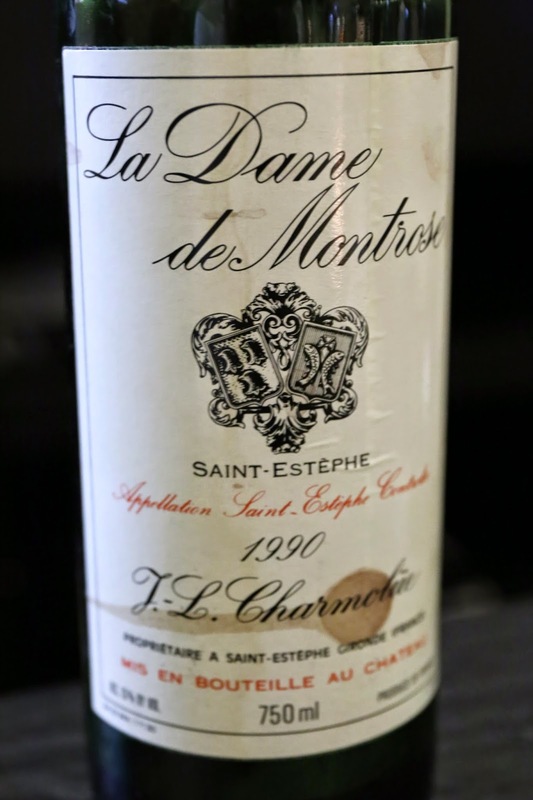 What an absolutely beautiful wine! Well, the four of us had a lot of fun hanging out tonight, and the wines did pretty well in general. But I have to be honest and say that dinner was a little disappointing. There were very few highlights tonight in terms of food, and at this price point I would be expecting a little bit more from the kitchen. While the service staff was very friendly and attentive, to be honest they fell a little short of my admittedly high standards. At a restaurant with no printed menus whatsoever, it is crucial that the waitstaff know exactly what is being served. Well, the staff don't always know the ingredients, which is a comment I had also heard from others. Their English could also be a little better, and I honestly had a little difficulty understanding their pronunciation of some of the ingredients. These are little details that, if they could work on it, would make things just a little smoother for me as a picky diner. This is why I love reading your blog. A free meal (your second, I presume) did not stop you from writing honestly and candidly about your third meal. Too many bloggers feel obliged to write positive reviews after they had been invited to meet the chef over a free meal. I have stopped taking those bloggers seriously. Some have shamelessly become product placement specialists, touting LeCruset and Miele products etc, to name a few.